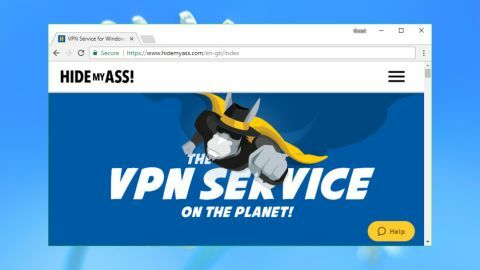 This VPN service is easy-to-use with a sprawling network of servers, but the session logging policies are a concern. HideMyAss! has been a popular independent provider of VPN services since 2005, but is now owned by security giant Avast. The company offers a vast network of 940+ servers in 280+ locations across 190+ countries. That's fewer servers than some of the top providers, but many more locations and countries (NordVPN has 5,400 servers across 61 countries, ExpressVPN has 2,000 servers across 160 locations and 94 countries). The HideMyAss! website proudly proclaims that it works on all your devices, and it just might have a point. Not only are there custom apps for Windows, Mac, Android, iOS and Linux, but there's installation advice to help you manually set up the service on many other platforms. And that includes the ability to configure some routers, which in theory should allow you to use the service with all your smart devices, too. HideMyAss! pricing is a little higher than average: $11.99 per single month, $6.99 per month paid annually, or $4.99 per month on the two-year plan. Supported payment methods include cards, PayPal and Skrill. There are cheaper services around – for example CyberGhost costs $2.50 on its three-year plan, and KeepSolid charges $2.78 over two years. But some of the big-name competitors do cost more, with for instance ExpressVPN's annual plan priced at an effective $8.32 a month, and IPVanish asking $6.49. A 7-day free trial gives you a decent amount of time to try out the service. You must hand over your payment details, and you'll automatically be billed for the annual plan when the trial ends, unless you cancel (which is easy to do online). If you buy, and then run into problems, you're protected by a 30-day money-back guarantee. That has some unusual conditions, though; in particular it's only valid if you've used less than 10GB of data and made fewer than 100 connections. This isn't quite as bad as it first sounds. The main reason for the cluster of documents is that HideMyAss! has moved key sections into separate articles, making them easier to find, and most of these are clearly structured and well written. This explains that there's no logging of the resources you access while online, or any of the data sent and received over the VPN. There is a significant amount of session logging, though. The service records the timestamp of every session connect and disconnect, a subnet of the IP address you used to connect to the service (if you connect from 92.145.233.343, 92.145.233.0 is logged), the IP address of the VPN server assigned to you, and the amount of data uploaded and downloaded. Normally, this data will be deleted at the end of the second month after the month it was created. For example, if you had VPN sessions on January 1 and 31, the data for both would be deleted on March 31. But, the company explains: "If we are notified or determine that your VPN account has been used in breach of our End User Agreement (including our Acceptable Use Policy, e.g. for spamming, file sharing or other illicit activity), then we may store your VPN Data for an extended period of time beyond the normal 3 month maximum." This kind of session logging won't matter if you're just using the VPN to protect regular internet activities like collecting email or online shopping. But if you're downloading torrents or doing anything else where someone might record and investigate your IP address, it provides a means for them to begin to relate those actions back to your HideMyAss! account, and that could cause problems later. There's another problem: potential customers have no way to confirm these logging promises tell the whole story. VPN providers such as TunnelBear, NordVPN and VyprVPN have allowed independent companies to audit their systems for logging, privacy and security, and publish the results. That's the only way to begin to reassure users about what a VPN is really doing, and we hope HideMyAss! and the rest of the industry will soon follow suit. Signing up for a HideMyAss! trial works much like any other web service you've ever used. Choose a plan, select a payment method – card, PayPal, Skrill, UnionPay and Neteller are supported – and hand over your money in the usual way. A Download page pointed us directly to the correct app for our Windows device, while also giving us links to Mac, Android and iOS builds. This isn't as well-presented as high-end competitors such as ExpressVPN – you don't get the same number of tutorials on setting the service up manually, and there's no link to download the Android APK file for manual installation elsewhere – but it covers the basics well. The Windows app opened with a very simple interface containing only three tabs and three buttons. 'Instant Mode' gets you connected to your nearest server for secure browsing, 'Location Mode' enables choosing a specific location, and 'Freedom Mode' helps you connect from a restricted country (Iran, China) to a less regulated location to help unblock websites and news. A well-designed Location Picker enables finding and choosing the servers you need. By default, this displayed seven sensibly-chosen 'Recommended' servers, but we could also choose to display streaming or P2P-optimized servers, our Favorites, or the full list. There are no ping times or server load figures to highlight the fastest or slowest locations, but otherwise the system does a reasonable job. You're not prevented from choosing a new location while you're connected to another, unlike some more restrictive apps. If you want to switch from the US to the UK, just choose that location in the list and the client reconnects immediately. The Preferences dialog looks basic, at least initially. It doesn't allow you to choose any protocol beyond the default OpenVPN, and its kill switch only works for applications, rather than the entire system. This means you must manually specify every application you'd like to be prevented from accessing the internet if the VPN connection drops. Apart from the initial setup hassles, you'll also have to remember to add other apps as required, which isn't exactly convenient. The client won't automatically reconnect if the connection drops, either. We forcibly closed our connection, and although the client notified us immediately with a desktop notification, it didn't try to reconnect. We were left to do that ourselves. Fortunately, the client also has a handful of useful bonus features. You can have the system automatically connect to the VPN when you access an insecure wireless network. An unusual IP Shuffle feature changes your IP address at a defined interval (30 minutes, an hour, a day, whatever you like), making it even more difficult for others to track what you're doing. And a handy Diagnostics screen displays the OpenVPN connection log, potentially very useful in troubleshooting connection issues. The Android app has a near identical interface to its Windows cousin, with the same design, the same simple connection modes, and (mostly) the ability to get connected with a couple of taps. The Location Picker doesn't list P2P servers, but that's not exactly a big deal for a mobile app, and overall it does a reasonable job. The app's Preferences dialog is also a close match to the desktop edition. There's no built-in kill switch, but the app can shuffle your IP address at regular intervals and automatically protect you when accessing untrusted networks. The app also adds a handy feature of its own, split tunneling, which enables routing only your choice of apps through the VPN (video streaming, but not your browser, say). We began our HideMyAss! performance checks by choosing a small group of test servers: three in the US, three in the UK, two in Europe, and locations in Australia, Hong Kong and South Korea to represent the rest of the world. Our tests began by connecting to each server in turn, recording the connection time, running a ping check to look for latency issues, and using geolocation to verify that the server was in the location advertised. There was good news in every area. All servers appeared to be where HideMyAss! claimed they would be. Connection times were speedy at around two to four seconds, even for the most distant locations (some VPNs are twice that), and ping times lengthened for far-away servers, but no more than we expected, and they didn't reveal any problems. We moved on to checking the download speeds from our test servers, and again got off to a very positive start. All three of our closest UK servers managed a very consistent 65-70Mbps, and we couldn't expect much more on our 75Mbps fiber broadband test line. If your connection is faster, you may see better results. European performance was almost identical, with results typically ranging from 66-69Mbps. Switching to the US saw very little difference, with servers averaging 58-66Mbps. The inconsistencies we observed in our last review of this service were gone, and HideMyAss! performed well at all times. Only going long-distance saw HideMyAss! speeds finally begin to drop, but even then, they were generally very usable (Hong King ranged from 28-38Mbps, for example). The only significant issues we had were with the South Korea server, which was almost unusable at around 1Mbps. That could have been a temporary issue which cropped up during the review, though, and overall HideMyAss! performs better than most. Point your browser at the HideMyAss! website and you'll read that the service allows you to "stream your favorite TV shows from wherever you are in the world using one of our dedicated streaming servers." Sounds good, but is it true? The HideMyAss! Windows client enables filtering its location list to display only streaming servers, and right now there are just four of these: two in New York, one in Florida and one in London. That's not exactly a lot of choice, and we wondered whether that would make it easier for streaming websites to detect and block them. This wasn't an issue for the UK server, which got us instant access to BBC iPlayer. The US servers successfully allowed us to browse US-only YouTube clips, too, but couldn’t get us into the much more heavily-defended US Netflix. That's disappointing, especially as HideMyAss! successfully unblocked Netflix in our previous review. This situation can change at any time, though, as VPN providers alter their setups to unblock the site again, so it's worth confirming our results by testing Netflix access from your device and location. The HideMyAss! support site offers a wide range of resources, including setup guides, a searchable knowledgebase, FAQs, a web forum, and 24/7 live chat for anything urgent. The web content isn't as in-depth or well-presented as some of the competition. ExpressVPN has a host of detailed setup guides, all easily accessible in a couple of clicks from the support page. HideMyAss! doesn't organize its articles quite as neatly, and when you do find them, there's less information, and occasionally some questionable points. The HideMyAss! web forum isn't a busy place, but post a question there and it'll normally be answered by a staff member within a few hours. Replies are generally helpful, and if the problem can't be solved on the forum, the support team will often create a ticket for you or send you a direct email to discuss the issue further. If you can't wait, live chat is on hand for near instant assistance. We posed a Windows setup question and within a couple of minutes, a support agent began giving us a helpful and accurate solution. That works for us, and overall, we think HideMyAss! should be able to help you solve most common VPN issues. This service's data collection policies could be a problem for the privacy-conscious. That said, speeds are good and you do get one of the largest VPN networks around, and if these are your priorities, HideMyAss! might be worth a try.